David offers a Heartfelt, Personal ceremony. Celebrate the uniqueness of life. Traditionally you would choose between a Vicar or Humanist to conduct a funeral service. 2). A humanist service without any aspect of religion. The majority of the population 'relate' somewhere between these two extremes. A heartfelt & personal funeral service that's all about you, your family and your loved one. David bridges the gap between the two above extremes! A funeral service with 'as much' or 'as little' spiritual content as you wish - or no spiritual content at all. Retired from ordained church ministry, which constrained me far too much, I now offer bereaved families a funeral service with 'as little' or 'as much' spirituality as you require - whether the service be cremation or burial. No restriction on content! I have an affinity with nature. Should you choose a natural burial, or interment of ashes at a natural burial ground then you will be guaranteed a unique, beautiful & heartfelt service. Emma at Sun Rising Natural Burial Ground will provide you with lots of loving help and answer questions you may have regarding natural burial (see below). The day on which you say your final farewell is like no other. When the inevitable happens it is reassuring to know that I am available to help and guide you through the process and assist you to make arrangements at what can be a very upsetting time. Please allow me the honour and privilege of performing this last task for your loved one. I will visit you at your home to meet with, and talk to, family members. A heartfelt, personal funeral ceremony will then be written. My promise to you: 'it will be a precious opportunity for expressing grief, saying goodbye, giving thanks and celebrating life'. It will be a service that flows from your beliefs and wishes, and those of the person who has passed away. 'You must have known xxxxx very well'. This means I captured the essence and told the story in such a way that people thought I was just talking about a dear friend. 'We couldn’t have done it without you' This means that the family knew that I was walking with them on their most difficult day, offering my talent to be their voice, and they felt heard, understood and comforted by my presence. This is an area where I am experienced and truly gifted. Handcrafting a personal service to celebrate the life of your loved one who has passed away. I have written and conducted many services in my 'home' area around Banbury, Warwick and Oxford. Sun Rising Natural Burial Ground is a beautiful and superbly managed nature reserve. Sun Rising offers peace and security you will feel wholly confident with - together with a caring, supportive and professional service for each and every family. Nature is sacred and must be respected. We belong to nature – nature does not belong to us. Nature, like church, is a sacred space. It gives us everything we need to survive. Every morning the sun rises over 'Sun Rising Hill', bringing vision, warmth and security. Without the sun & rain, crops will not grow. Life on earth would not survive. How wonderful for this to be our final resting place. Every service I conduct at Sun Rising Natural Burial Ground, is a privilege. My ministry there is blessed beyond measure. Chapel Ceremony at a Crematorium. The chapels are modern, beautiful, tastefully decorated and offer music (piped, recorded or organ). The service would be followed by Cremation and the ashes could either be scattered or interred, maybe at a a Natural Burial Ground. 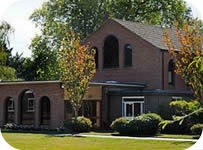 Funeral home with a Private Chapel. Followed by either a traditional Burial or Cremation. Maybe also consider a Natural Burial Ground for burial or Interment of ashes. 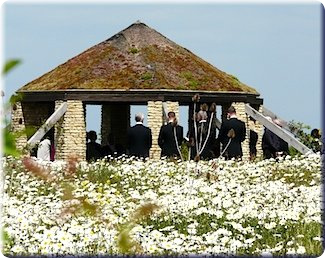 Green Funeral at a Natural Burial Ground. Sites can be mown wild flower meadows, field sites where new woodland is being established, set within existing woodland or more manicured parkland settings. You can choose to have the full service at the Natural Burial Ground, or if there is to be a cremation then the remains can be interred there. 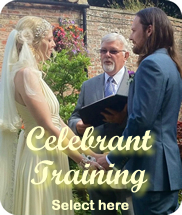 You choose whether to have a traditional style service with hymns, readings and prayers or something more different. David will discuss the service with sympathy, sensitivity and understanding. David is experienced, and truly gifted, in hand crafting a personal service to celebrate the life of the loved one who has passed away. Whilst David provides spiritual counsel for any life situation, his focus lies in assisting families with funerals/memorials, and helping families make peace when a loved one is dying. David is not religious - but spiritual by nature. Meeting the family to discuss the service arrangements (please allow up to 2 hours). David's fee is normally paid by the Funeral Director arranging the service. Please call to discuss how I may help.